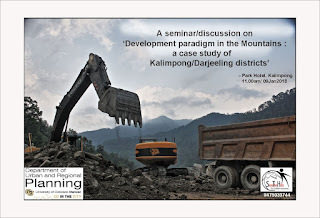 In Jun2017, a team of researchers from the Dept of Urban and Regional Planning, Colorado University (Denver, USA) spent three weeks in Kalimpong and Darjeeling districts studying development and associated hazards (see here). Prof Andrew Rumbach who led the team will be sharing the findings of the study in the seminar. We will also have a small expose' on Project 'LANDSLIP' during the event.